DCU captain Jordan Morrissey, holding the All-Ireland Freshers trophy, and man-of-the-match David Garland celebrating DCU’s two-point victory over UL in Portarlington. Image Credit: Conor Breslin. 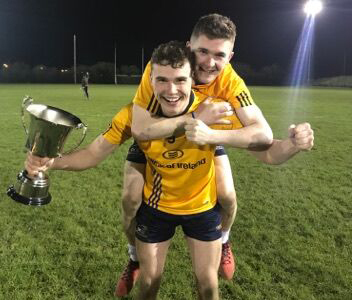 DCU Freshers had to work every minute for their victory in Wednesday night’s Freshers football final in Portarlington as they captured their third All-Ireland title in a row after a hard-fought 0-10 to 0-08 win over University of Limerick. DCU entered the match favourites with five of the starting fifteen having played in All-Ireland finals before for club and county. However, before the match DCU captain Kieran Dwyer said that the odds didn’t matter to him or the team. “Finals take on lives of their own, there is no point getting this far and falling at the last hurdle,” Dwyer said. With the absence of the team manager Brendan Gillen, the duty of care fell into the hands of his trustworthy backroom team. DCU quickly got to work, with Frank O’Reilly landing on the scoreboard after just 60 seconds of play from a neat one-two play with half-forward Sean Bugler. Five minutes in, DCU doubled the lead. A nine man move that started from Dwyer ended with full forward Luke Gilmartin swinging the ball over the crossbar. UL eventually got their first score after nine minutes of play through a 40 metre free from full forward Brian Friel. DCU responded quickly however with the ‘dinky’ corner forward David Garland landing his first of seven points. UL tried their best to cut through DCU’s line of defence but to no avail due to the physicality and intensity led by Mark Curran and Dwyer. UL took their time but eventually got rewarded with an energetic late run from left-half back Tadgh Corkery, who popped over a superb point. DCU kept their distance with scores from the man of the match David Garland, who fired over a free after 17 minutes. With dry conditions, David Garland put three points between the teams from a placed ball. However, UL refused to lie down and scored two late points from Joe Dawson and Chris Óg Jones before halftime to put one point between the teams. The teams went to the dressing rooms 0-05 to 0-04 with both DCU and UL tallying 5 wides apiece. Monaghan man Garland opened the second half with a free after two minutes – but this would be DCU’s final score for fifteen minutes. The Munster men eventually hit form by knocking over three unanswered points from Brian Friel, corner back Michael Reidy and substitute Tom Hoare. With a combination of wides, turnovers and poorly contested kick-outs, UL saw a sign of hope in DCU’s frustration. Man-of-the-match Garland was able to equal the score from a free, yet UL had no desire of giving in as Corkery tried to score his second point. However, this was denied from a wonderful save by goalkeeper Sam Burton. With seven minutes remaining and UL leading by one-point, Portarlington witnessed the emphatic teamwork from Garland and Jordan Morrissey who fired over one point apiece to give DCU the lead. With five minutes of injury time to play, UL went on an all out attack but was denied any entry into DCU’s 45 due to the intense presence of Peadar Mogan and Darragh Ryan. With one last attack from UL, DCU hearts were nearly broken by a shot at goal from Niall Collins. Sam Burton got his fingertips to the ball and denied the shot. In DCU’s final attack, a score from substitute Barry Gorman was the cure they needed which sent them on their way to their third All Ireland in a row. Reflecting on the winning performance, the victorious captain Dwyer praised his side’s teamwork and spirit. UL Freshers boss John O’Grady admitted he was “gutted” but was proud of his players after the game. “Gutted, but such is sport,” O’Grady said on Twitter. “Congrats to DCU GAA. It was a fair battle right up to the end, yere [sic] fitting champions. Enjoy the celebrations. DCU Team: Sam Burton, PJ Daly, Kieran Dwyer, Keith Murphy, Darragh Ryan, Mark Curran, Peadar Mogan, Billy Courtney, Jordan Morrissey (0-1), Frank O’Reilly (0-1), Sean Bugler, Eoin Smith, Luke Towey, Luke Gilmartin (0-1), David Garland (0-7). SUBS: Daniel Brennan for Courtney, PT Cunningham for O’Reilly, Adrian Cummins for Towey (Black card), Barry Gorman for Gilmartin, Billy Mannion for Brennan. UL Team: Dylan O’Leary, Peter Paul Sauderland, Niall O’Mahony, Michael Reidy (0-1), Patrick Warren, Niall Collins, Tadgh Corkery (0-2), Joe Dawson (0-1), Brian O’Malley, Adam O’Donoughue, Ryan O’Donoughue, MacDarra Geraghty, Chris Óg Jones (0-1), Brian Friel (0-2), Brendan McKeown. SUBS: Tom Hoare (0-1) for McKeown, Daniel Enright for O’Malley, Aaron O’Brien for Geraghty.